I'm often asked the question, "What is a missionary?" I suspect the reason is because my husband and I have served formally as missionaries in Australia since early 1997 and we were on deputation for a few years before that. I've explained the concept of missions so many times over the years, but the truth is that the words "missions" and "missionary" isn't even once in the Bible. The concept is there, of course, but not the actual vocabulary. Paul is often referred to as a missionary, and his travels as his missionary journeys. The phraseology in the Scriptures would be "the work of an evangelist." He traveled around spreading the Good News of who Jesus Christ was and what He did for us as individuals through His death, burial, and resurrection. You may have heard this referred to as the Gospel message. He was fulfilling a task or a mission that God had given him to do (as well as to all believers) . Hence, we refer to Paul as a missionary. So, what is a missionary really? Is it just someone who is a preacher or a teacher of the Bible? Do you have to travel to another land to qualify as a "real" missionary? I don't believe so. In fact, I believe that whenever we are letting our light shine (the Love of God shining through us), we are being a missionary no matter where we happen to live. My own dear mother is a great example of what being a missionary is all about. She never left the United States and rarely left her own state. She was a stay-at-home mom (and a wonderful one at that! ), but she had the right idea. The following is something that she wrote that is a great lesson to us all about what is a missionary. We have a sign over the entrance to our home that reads: "You are now entering the mission field!" As you leave our home there is a sign over the door to go out that reads: "You are now entering the mission field!" So many have come and gone through those doors and some have smiled, laughed, and even looked dumbfounded at the signs. One said, "I thought you had the one coming in because you had an unsaved person living in your home," such as my father-in-law was. Some have thought it was to remind our family to witness to the unsaved that come into our home. Others have even thought we are just trying to be spiritual, or at least look that way. Our Pastor strongly teaches and preaches soul winning and discipleship. I have found, however, that more people are concerned about being a good testimoney outside of their home and in front of others than they are to their own family. Your children will seldom be more than you are. We are ALWAYS discipling, either for good or for bad. Our children and husband see all sides of us so that they know us as we really are. I determined that I wanted to be "instant in season and out of season" concerning my testimony. I wanted my family to know that I am not a hypocrite and that my first responsibility was to have a good testimony to my husband and children. 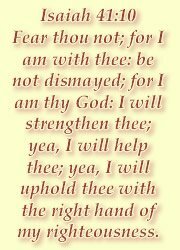 If I am faithful to them then I will be faithful outside of my home too. Kind words are not just for others, but for your family first. Patience, understanding, generosity, and loyalty are what we owe to our family first, then to others. We "preach" exactly what we "practice." We don't need to "tell" our children the right way, we need to "show" them by our own behavior. Our "mission field" is first our family and then the world. If you want your family to live in the "mission field" to God's glory then show them that everywhere, but starting with each other in their "mission field." Isn't that the true essence of being a missionary? I think so. I praise the Lord that I had such a fine mother who had a close relationship with the Lord herself and such a strong and sincere desire to please Him in her daily life. Now that the question of what is a missionary has been briefly dealt with, consider whether or not YOU are a missionary yourself. You may or may not be led by the Spirit of God to become a foreign missionary; to leave your homeland in order to share the love of God to those in other countries. It's a great privilege to take on such a task, but it has its hardships as do all things in life. There is much to be said about learning how to become a missionary on a foreign field, but that can be left for another day. Today I want to specifically challenge each one of us to learn how to become a missionary right where we are now. It's so simple and yet so hard. In a nutshell it can be summed up in one word - Christian. If we endeavor to be a true Christian, we will automatically be a missionary. I'm not talking about making a simple profession of faith. That's a good place to start, but there is so much more to being a Christian than that. I'm talking about becoming more like Christ. In order to learn how to become a missionary, we need to learn how to be like Jesus. As I said, it's simple, but not easy. The world, the flesh, and the devil will fight against us but with the Spirit of God in us, we can have the victory on each battleground. "...because greater is he that is in you, than he that is in the world. " I'm not special because I have obeyed the leading of God and my husband to live in a land that is not of my birth and share the Gospel here. I'm simply obedient. You can be just as obedient to God's command in your life by striving each day to please the Heavenly Father in every way possible wherever you live. 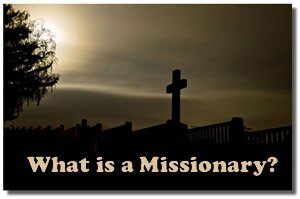 What is a missionary? To me, a missionary is someone who is on a mission to love God with all of their heart and obey Him no matter what the circumstances. Are you a missionary, too?